There are two possible approaches when health professionals are faced with a breastfeeding mother and baby and unusual circumstances. The typical and usual response is: “breastfeeding is in the way of the best care” and the answer is a default: “give formula”. On the other hand, it is possible to pause and think: “Breastfeeding is important, let us find a way to make this work so that this mother and baby can continue to breastfeed.” Or at least to continue receiving breastmilk. One such example is a situation of a diabetic pregnant mother whose baby at birth has a higher chance of low blood sugar and thus might be separated from the mother at birth, taken into the NICU and given formula as part of the “treatment” of hypoglycemia. For years, I have thought there could be a different approach, one where the baby’s health would not be compromised and at the same time breastfeeding and avoiding formula would also be a priority. I have been advocating prenatal expression of colostrum since the 1990s and presented such an approach at a conference in Hamilton New Zealand in 2004. Since then, the Waikato hospital has been encouraging mothers in the high risk prenatal clinic to express their milk before birth so that the colostrum could be offered to the baby instead of formula. At the same time, babies are kept skin to skin with the mother, which helps maintain the blood glucose, and the baby is at the breast as soon as possible after birth. And now, finally, many years later and a couple of small studies and plenty of experience later, a study, called Advising women with diabetes in pregnancy to express breastmilk in late pregnancy (Diabetes and Antenatal Milk Expressing [DAME]): a multicentre, unblinded, randomised controlled trial has been published in the Lancet, one of the world’s most prestigious medical journals. It shows that prenatal expression of colostrum is safe without side effects for either mother or the baby. 5 minutes to express this amount. In our clinic, we recommend that mothers start expression their milk at about 35 weeks gestation. The mother is taught hand expression which, when quantities are not large, as expected during pregnancy, usually works better than expressing with a pump. The mother can express whenever she can, at least once a day and stores the milk in a container as shown in the photo or a test tube or as shown in the article. The milk is stored frozen and brought to the hospital frozen. 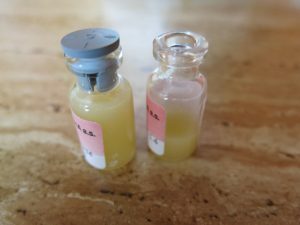 If there is concern that the baby remains at risk for low blood glucose after breastfeeding after birth, or if the baby does not breastfeed, the previously expressed colostrum can be thawed and given by lactation aid at the breast, cup, spoon, but preferably at the breast with a lactation aid.